Our Top Three Valentine’s Day Candy Recommendations from the World’s Largest Candy Stores! …as evidenced by the melted chocolate around her mouth. When it comes to Valentine’s Day candy, chocolate isn’t the only kid on the block. If you want points for creativity, pass on the red heart-shaped box from Walgreens. I can also do without those chalky pastel message hearts, thank you. Our travels have brought us to several BIG candy stores where the selection is vast, and the ideas are limitless. For inspiration, I recommend visiting one of the world’s largest candy stores from this list before buying sweets for your sweetie. I’ve also made a few suggestions on what to buy to commemorate Valentine’s Day, if you want to go a step beyond predictable! b.a. Sweetie Candy Company, Inc. While Sweeties Candy is the largest candy store in Arizona, its no-frills warehouse in Cleveland, Ohio bills itself as the “largest candy store in the U.S.A.,” offering the “largest selection of candy in the world.” Those are some pretty BIG claims, so we went to check it out last summer on our Cleveland road trip. You’ll need at least an hour to cover the 20,000 square feet housing ten aisles of candy – over 3,500 different varieties, stocked floor to ceiling. You’ll find a lot of bulk candy on display in addition to small packages, and all the tools – molds, sprinkles, sugars — to make your own candy. 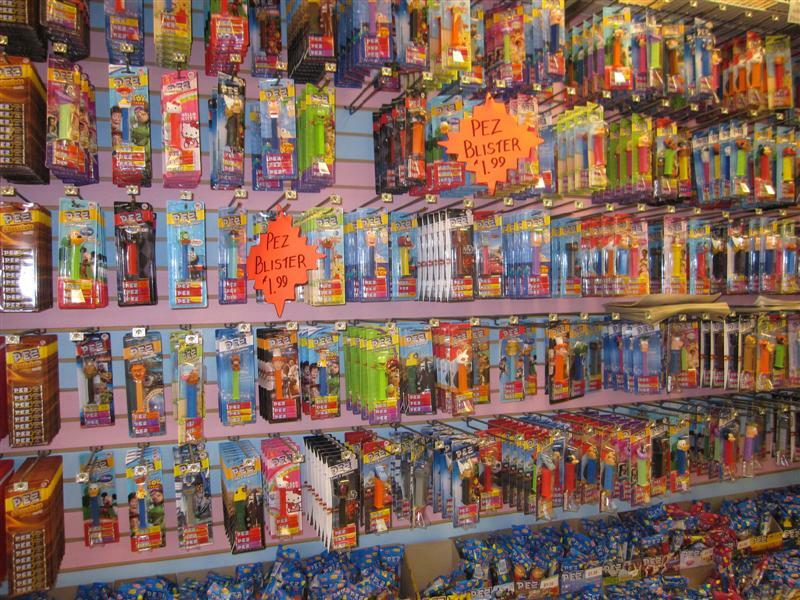 There’s an entire wall dedicated to PEZ dispensers and hard-to-find candy flavors like chocolate and cola. I loved discovering brands I’ve never heard of before, like Pearson’s Nut Goodies, Chase Cherry Mash candy bars, and Annabelle’s Abba-Zaba Taffey. Best Bet For Valentine’s Day – Head to the large Jelly Belly display, and mix a custom blend from the vast variety of colors; including all sorts of red and pink hues. I don’t mean to send my friends out on bad “Go BIG” assignments. It’s just coincidental that our last two gracious volunteer correspondents got stuck with duds. First, Sandra spent a small fortune on the cheesefest that is Santa’s Enchanted Forest, the world’s largest Christmas theme park. 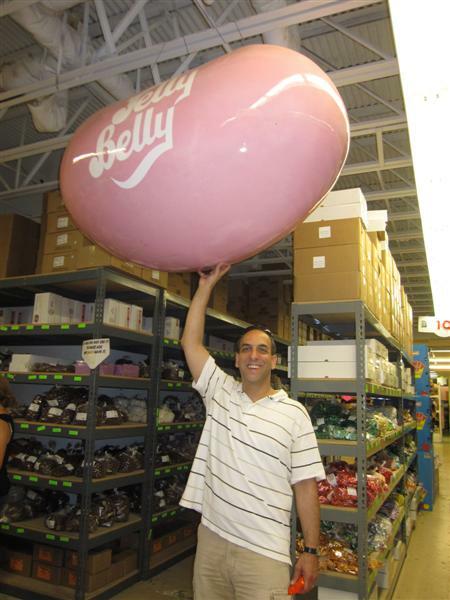 Now, Tom has submitted this report from his visit to the world’s largest candy store. This place, you will note, has been awarded the lowest score in “Go BIG” history. Even though I’m a raging chocoholic, I think even I would have scored it low. I appreciate Tom’s relative restraint, and the humor he found in the situation. He presents more humorous slice-of-life tales in his blog, and on his new site, Creature Banter. If you’ve ever laughed at the naïve yet absurd utterances from the children in your life, you’ll appreciate his collection. After a post-holiday week-long trip back to my East Coast roots, we were facing a 14-hour drive to our Indiana home. Connecticut to Indiana. Just typing it makes me shutter. 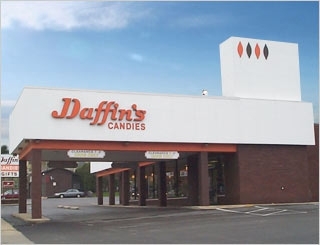 So we were thrilled to hear that our reward for the 300-mile trek through the state of Pennsylvania was a visit to Daffin’s, which calls itself the world’s largest candy store. The store resides in Sharon, PA, a few miles off Interstate 80. The store’s website boasted of Daffin’s Chocolate Kingdom – including chocolate villages and a 400-pound chocolate turtle. This was not to be missed. So we were excited to bribe the child with candy, and what would surely be a visit to paradise. The location was a bit hard to find, as its location was a few miles from the highway, but we were determined to find it, and indulge in some chocolate and candy. We finally arrived…or did we? Is this the place? Or is this a pharmacy? HALLOWEEN EDITION WITH GIVEAWAY OF BIG CHOCOLATELY GOODNESS! I know I’m starting to sound like a scaredy cat. I assure you it’s mostly just a fear of heights. And spiders. And 200 TV channels all airing reality shows at the same time. Given my delicate nature, Halloween tends to not be my favorite holiday. But Jack O’Lantern festivals are just my cup of tea. They’re more about fun and artistry, and less about fright and gore. There are two events this year vying for the world record for the most Jack O’Lanterns lit at one event. The Keene Pumpkin Festival in NH is the largest and oldest. The world record for the number of Jack O’Lanterns lit at one event was broken here eight times, until a 2006 event in Boston topped it. 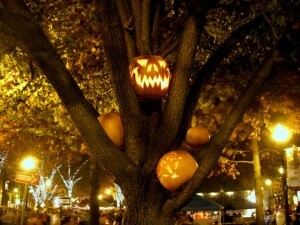 Still, last year’s 29,762 pumpkins was a record for this festival, and the world record may be broken again this year! The 20th anniversary of the Keene Pumpkin Festival takes place on Main Street in Keene this Saturday, October 16. In this corner, the challenger! 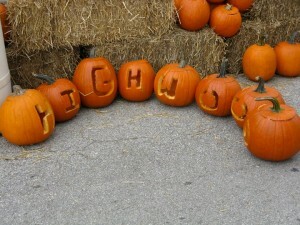 The Great Highwood Pumpkin Festival in IL, is preparing to take its own shot at the world record this year. The whole community participates, creating and donating their own carved creations. They anticipate lighting 32,000 Jack O’Lanterns to take the title! This event takes place October 20-23 in Highwood, IL. Full disclosure: we have not been to either of these events. But we have been to The Great Jack O’Lantern Blaze in Croton-on-Hudson, NY for five years in a row. There are over 4,000 Jack O’ lanterns on display here; nothing to sneeze at! And since this event is my personal, “hometown” favorite, I’m going to give them a plug. The level of artistry and creativity at the Blaze is notably above par. The Jack O’Lanterns cover the grounds of a 17th-century historic site; hanging from tree limbs, perched on rooftops, and incorporated in themed vignettes. You’ll see an undersea aquarium, a field of detailed Celtic knots, a den of dinos, a beehive, pirate ship, and a group of mummies with a pyramid. Amazing. If you would like more information about these and other Jack O’Lantern festivals, I recently wrote this article for WomansDay.com about ten different events across the country. Some updates on our Go BIG travels, news, and links to sites we like! First order of business today…me begging for your vote! I’m not ashamed to say that I nominated myself to be on Babble.com’s list of “Top Twitter Moms” under my Twitter handle, “GoBIG_GoHome.” I’m trying to get some publicity for the blog. Currently, I’m ranked around #65. If you are willing, could you please go to this page by clicking here to vote for me? Search for me on page 2, listed as “GoBIG_GoHome.” If you click “Like,” my ranking will improve tremendously! THANKS!!! We’re very excited to be the FIRST guest bloggers on The Wanderlists! This is a a great site dedicated to exploring the world with kids by your side. Check out our post here. 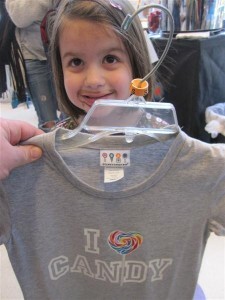 Our guest post for Trekaroo also came out this past week! We’re spreading the word about BIG family fun! We were also hugely, largely, bigly (okay, not a word) flattered to be included on this list of fun family travel links on the Travels with Children blog. Last Thursday the kids were off from school, so we went into NYC for a day of fun in and around Times Square. Our agenda included Madame Tussauds’ wax museum (creepy), the new Pop-Tarts World (sugary), Bryant Park (lovely), the Hard Rock Cafe (yummy), Midtown Comics (super hero-y), and the Hershey’s Store (chocolately)! I’ve trained them to sniff out and locate the largest pieces of chocolate they can find. In this case, the “World’s Largest Hershey’s Bar,” five lbs. of choco-heaven. Good job, kids. Now put it back. 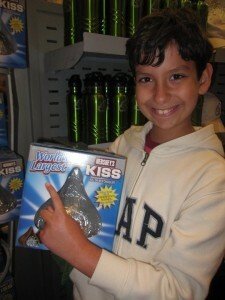 It’s the “World’s Largest” Hershey Kiss! Actually, it’s a huge, hollow Kiss containing a bunch of individually-wrapped Kisses inside it. Commence salivation.